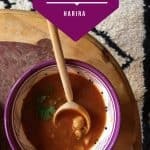 For Moroccans, harira soup is a Ramadan ritual. Every evening families sit down to bowls of steaming harira – even when daytime summer temperatures soar about the 100F mark. I love soup, but the last thing I want to do is leave my stove on for hours during the hottest part of summer. Instead, I created this quicker version to satisfy the Ramadan ritual but keep my house at a tolerable temperature. Traditional harira is made with dried lentils, dry chickpeas, rice, vermicelli noodles, a potpurri of herbs and spices, vegetables, and meat – most often lamb. If you’ve ever cooked with dry chickpeas you’ll know this part of the cooking process can take hours, just to soften the beans. I really prefer this soup without meat (but that’s kind of every food lately! ), and omitting meat automatically cuts off cooking time. My next shortcut is to use a pre-made broth and canned chickpeas. Recently I filmed an episode for a series called Chez Benali that is airing on NPO2 (Dutch national TV). The recipe I shared was this one for my version of gluten-free, vegetarian harira. You can catch the episode I’m in below. The entire series is really good and isn’t all in Dutch so don’t worry! I wasn’t sure how this short-cut soup was going to be received but surprisingly MarocBaba actually preferred this version to others that I have made. I know that this is one recipe I’ll be holding onto for a long time to come. 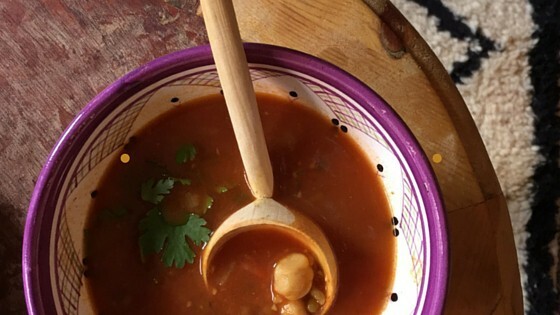 When the temperatures drop I’ll be wanting a big giant bowl of this harira to warm me up. 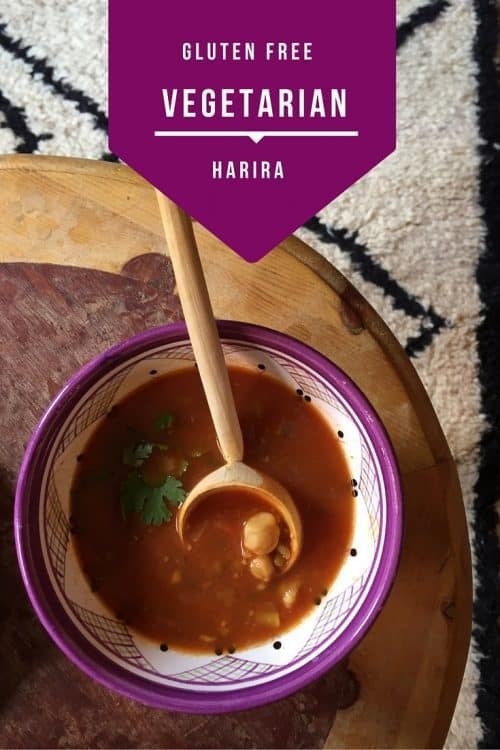 This dish is not only vegetarian but it’s a vegan Moroccan harira soup. 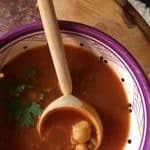 I use brown lentils as they are easy to find in Morocco and inexpensive but you could also make this with red lentils, just add them a little bit later as they don’t take quite as long to cook. This soup takes 45min to 1 hour to make. Traditional harira takes several more. You might not be making this every night, but by making one big pot you’ll be guaranteed leftovers. To preserve, transfer soup to smaller sized, freezer safe containers and allow to cool completely. Cover the containers, and pop into the freezer. When you want to use it again, transfer to your refrigerator until the soup can be removed from the container. You could also submerge it part way in warm water. Heat through in a pan on the stove top. Heat olive oil in large stockpot on the stovetop. Finely chop onion and garlic, and saute in the stockpot. Wash and core tomatoes and then puree in a food processor along with parsley and cilantro. Add tomato and herb puree along with salt, pepper, paprika, turmeric (and saffron if desired) to the pot. Next, add water, tomato paste and 1 carton of vegetable broth to the mix. Bring the soup to a boil and add lentils, rice, and garbanzo beans and reduce heat to medium. Cover. Once the lentils and rice are tender (will vary but about 20 minutes) turn down the heat. You can thicken the soup by adding a flour roux or leave as is. The harira should be thick but still have a soup consistency. This is often served alongside dates, boiled eggs and chbekiya on a traditional iftar table during Ramadan but you could simply have some fresh bread or even a salad alongside to lighten things up. I tried this recipe and I think it’s too spicy by adding 1 Tablespoon paprika. Next time, I added 1/2 Tablespoon paprika, it was still spicy. Please advise to avoid spicy flavor. I am Indian and I cook Indian food, and this tasted very spicy to me. Hi Nsk- are you using paprika or red pepper? Red pepper will be way too hot. The paprika we use is very mild, just a smoky flavor – I’m thinking that may be the issue? How many servings is this? I have to feed 4 plus I want leftovers. 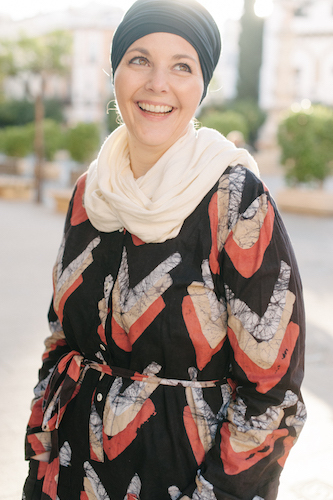 Hi Angela – this will certainly make 4 servings with some left over! If you want leftovers, keep the rice/noodles separate and add them to the dish as you go. They don’t freeze/reheat well. This is such a wonderful and healthy soup ,loved the flavors used in this too….this is going into my must try asap folder. i loved this soup, after fasting i ate this soup, made it from scratch and followed it exactly accept did not put whole carton of the veg stock and did not thicken it. was very delicous and all my friends now want this recipy. will also try out other recipys from yr blog.